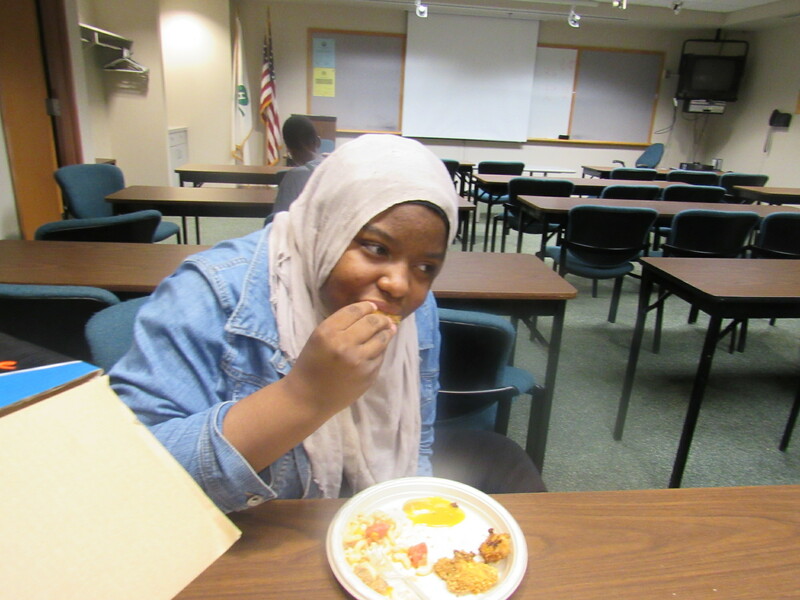 In this Science of Cooking café,we discussed the meat known as chicken, including its origins and world appeal. History and culture addressed: Chickens are native to Asia and Europe and are considered an ancient food, dating back some 4,000 years ago. While chicken is used as a primary source of protein, it is also very lean in the breast portion of the meat. Health benefits include: it contains nutrients such as tryptophan, selenium vitamin B6, protein, phosphorus and choline. Some of these nutrients have been known to increase bone density in the elderly, reduce cancer in patients and protect against Alzheimer’s disease. Of course, this was awesome because it whetted our appetite and led to the actual dinner portion of the cafe! The best part of the discussion was talking about healthy food substitutes and the teens got really noisy with this part of the discussion. This was also the Big Idea: Easy ways to eat healthy and still have tasty food. The interaction was relaxed and informal and can more readily be described as a conversation vs a lecture. Genetic studies have pointed to multiple maternal origins in Southeast-, East-,and South Asia, but with the clade found in the Americas, Europe, the Middle East and Africa originating in the Indian subcontinent. From India, the domesticated chicken was imported to Lydia in western Asia Minor, and to Greece by the fifth century BC. Fowl had been known in Egypt since the mid-15th century BC, with the “bird that gives birth every day” having come to Egypt from the land between Syria and Shinar, Babylonia, according to the annals of Thutmose III. The chicken genome has changed less from feathered ancestors eradicated by the Cretaceous–Paleogene extinction event than those of other sequenced avian dinosaurs. 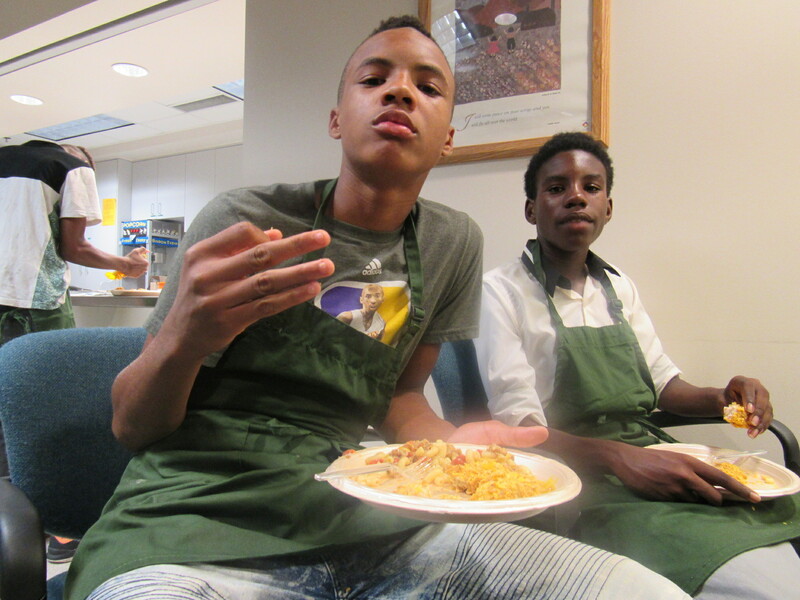 Teens at the STEAM Café in Michigan explore the world of cooking. 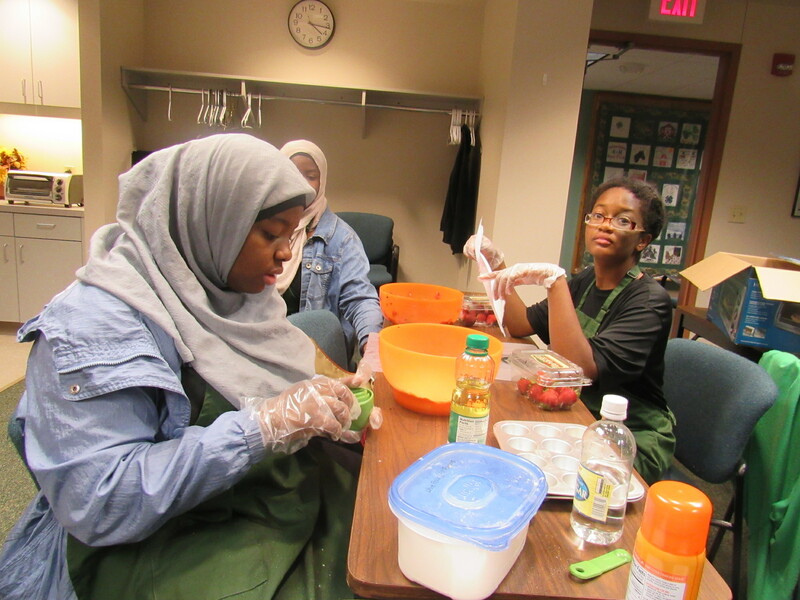 Caprisha Curry led a short discussion on kitchen etiquette and the proper ways to use knives and hot plates while cooking. Then we broke out into groups to cook! Recipes with proper measurements and instruction included. Bake “fried” chicken, Cheesy Turkey Mac and Berry Berry Muffins were on the menu.